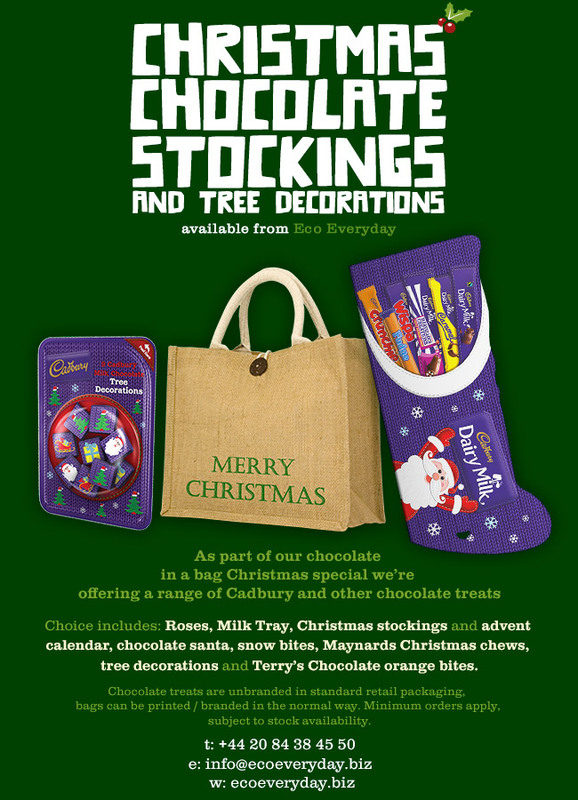 As part of their chocolate in a bag Christmas special, Eco Everyday are offering a range of Cadburys and other chocolate treats. An Ideal solution for businesses wanting to make their Christmas promotions as green as possible this season. Choose from a selection of Cadbury’s Christmas themed chocolates to go with their Green & Good bags for life. Choices includes: Roses, Milk Tray, Christmas stockings and advent calendars, chocolate santas, snow bites, Maynards Christmas chews, tree decorations and Terry’s Chocolate orange bites. Chocolate treats are available unbranded in standard retail packaging, bags can be printed / branded in the normal way. Minimum orders apply, subject to stock availability.